The human heart (we are mammals afterall) creates enough pressure when it pumps out to the body to squirt blood 30 feet. In my next life, I want to be a pig. Creeepy ... but I’m still not over the pig. Do not try this at home. Unless you watching Generations. The flea can jump 350 times its body length. That’s like a human jumping the length of a football field. *blank stare* Yeah whatever. Lucky pig. 30 minutes they say? Can you imagine?! Seriously what could possibly be so tasty on the bottom of a pond? I still want to be a pig in my next life…quality over quantity baba !! If you’re ambidextrous do you split the difference? Note: Ambidextrous means being adept in both hands, that's if you've been too busy toyi toying with Juju instead of studying. OK, so that would be a good thing, right? Who would want something that fat to jump anyway. I wonder who was paid to figure that out? If they switch ton their right hand, they’ll live a lot longer. Hao Madoda ... What about that pig? These above mentioned statement have actually been scientifically proven. Ladies think twice before calling your man a pig when you angry, he may just be think you are complimenting him. LMAO! mara wena Phil. You killing me so early in the morning... that pig though... hmmmmmmm! and you and the Masina brothers????? hehehehehehehehe!!!! hahahahahahaha! Pig? 30 minutes! hha ah! unbelievable! 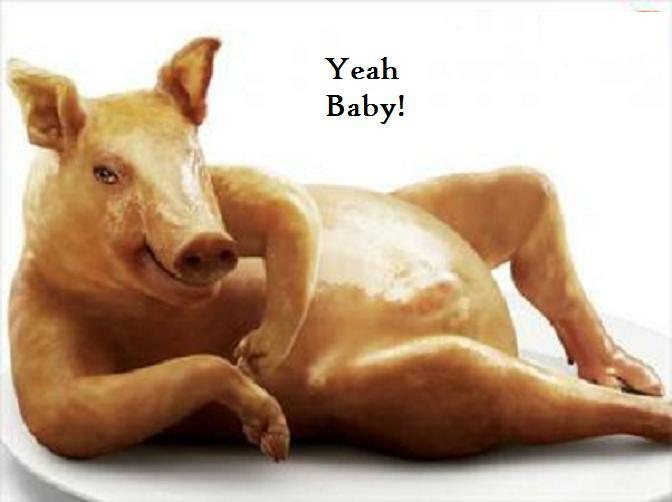 If 'ts true...'d realy like to be a pig, just for a day!